I’ve seen it happen over and over again: first-time startup founders, without technical co-founders by their side, want to hire a developer on their own. But regardless if they go for freelance, a trainee or a senior developer, the founder ends up being in way over his or her head. They have no idea how to manage a developer, how to communicate their ideas to them, how to keep track of their work, etc. Unfortunately, this often leads to founders and developers mistreating and misunderstanding each other, and conflict arises in situations where it wouldn’t have been the case otherwise. 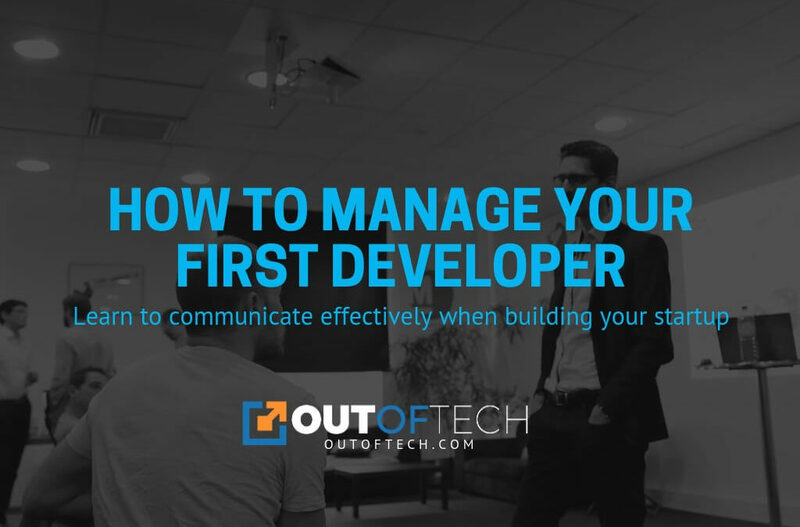 I truly want you to be able to communicate effectively with your first developer and make each other grow, so today I’m giving you the tools to do just that. It’s very important that you know the difference between the two. A vision entails what you want for your business and your life in two to three or five years. Your milestones are more of short- to midterm ordeal, representing what you want in two to three or five months, and they are in turn stepping stones towards your long-term vision. If you want to dig deeper into this sort of planning, check out this post I did last week. My advice? Have a clear prioritization score. For you, it may be clear what matters most when developing new features or providing new services. But to a developer, it all becomes a blur. It’s your job to translate your thoughts and values into something other people can clearly understand. If you want to understand a bit better how to carry this through, check out my course Startup Tech Challenges: From Zero to a Million Users. Share all of this with your team. This is the driving force of every minute and penny invested in the development of your solution, so make sure it’s out there. Everyone in your team should be on the same page regarding the startup’s immediate, midterm and long-term goals. The milestones should be planned for, reached and celebrated as a team. Whatever level of success you reach will be a result of team effort, and it will be fueled by sharing the same horizon. So share! If you know absolutely nothing about tech management, go and learn everything you can about the Agile Scrum methodology. There are a lot of resources online that cover this topic in depth, so soak it all up. This methodology is THE ONE for startup companies. As startups, we learn more and more everyday about the market, and the technologies available to us. Consequently, roadmaps should be readjusted accordingly, at least every week. Developers should learn how to play within this persistent state of shifting, and a great startup developer should strive in it. This may go without saying, but when you are just starting out at tech management, you need to plan a time margin for delays. There’s always something unexpected, especially in startups. You don’t want to get caught three days before the launch dealing with a deployment crisis, do you? Plan accordingly, and make sure there is some wiggle room for accidents, mishaps and some rerouting. This is VERY IMPORTANT. You need to have access to the developer’s environment, that is, to their work. Make sure you are able to test it. How else would you know if what he or she is developing fits your expectations? The trickiest part of startups is mastering communication between different working team members, for instance, between an executive and a developer. Following through the principle of sharing, you all need to be on the same page on whatever you have to do. You might have already brainstormed by yourself as a founder, but you need to do it again with your technical team to think of more relevant technologies, more appropriate features, and let yourself be advised and guided by the experts, without foregoing your company’s roots. You should ask your developer for estimated times of completion for EACH feature and to commit to the time required for each individual time frame. It’s best not to calculate for the whole project in case of a delay on a certain feature or between features. This way you will know exactly how the scheduling will be affected, without having to calculate it all over again. Every day you should have a quick stand-up meeting with your developer, usually no longer than 10 minutes, where you will check in on what was achieved the day before, what they are struggling with, and what they expect to complete by the end of the day. Again, if you’d like to know more about this topic, check out the free course From Zero to a Million Users. You can also learn some quick tech management tips for early-stage startups from AskMyCTO video series. And if you’d like to work with me directly, feel free to book your first free call with me.